This is Jason Hatch from Gilbert, AZ, who, with his wife Machell and their four children, visited the Knight home in October of 2014. He is shown here installing a rain gutter on the side of the house facing the Susquehanna River. 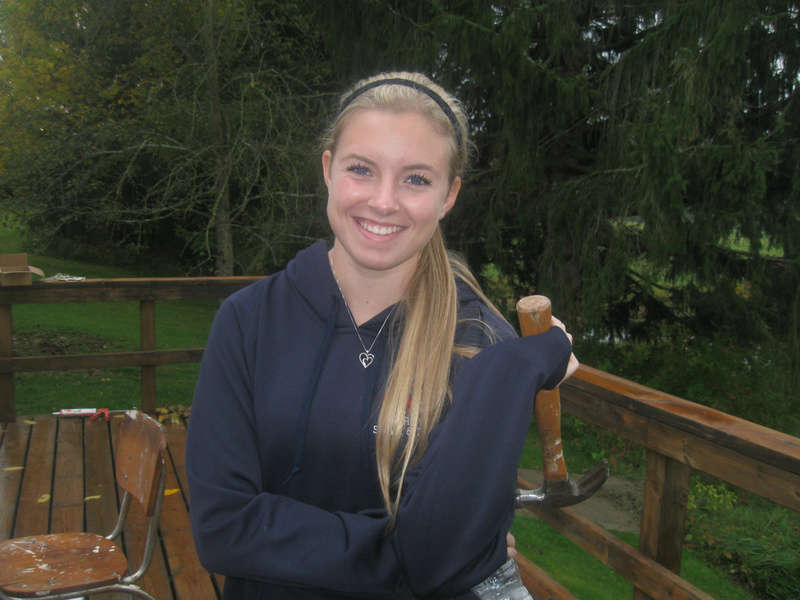 Meet Tessa Hatch, the oldest of Jason and Machell's children. She is standing on the deck of the home busily engaged in the never-ending job of sanding and finishing of household antiques. Machell, on her second visit to the Knight home, is shown arranging items on an antique shelf she had sanded, finished and hung in the home's kitchen. 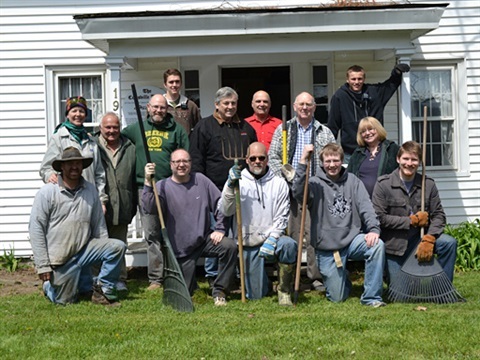 This is a group photo of members of the Green Branch participating in one of the annual work-days that has taken place over the last ten years. The commitment, dedication and accomplishments of the faithful membership of the Green Branch is and has been appreciated beyond measure. 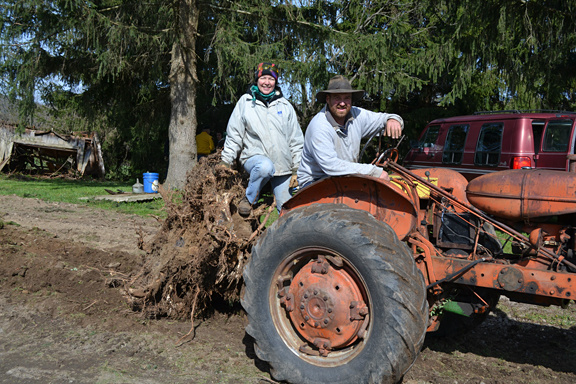 This picture is of Phil and Elaine Sherman removing one of the four stumps (and pine trees) so that a parking lot could be created to accommodate the many tour buses that visit the site. 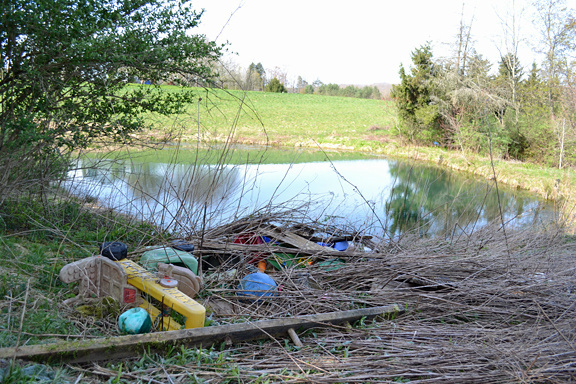 This, too, was a Green Branch initiative that involved the use of heavy equipment and numerous truck loads of rock and gravel. This photo represents two things. 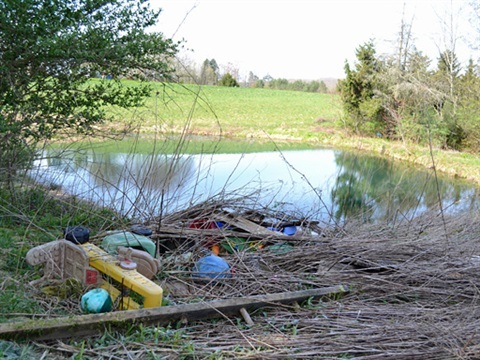 1st, the small (approx one acre) pond that is on the property, and no it is not Pickeral Pond, and 2nd, the omnipresent debri that has to be contended with continually. 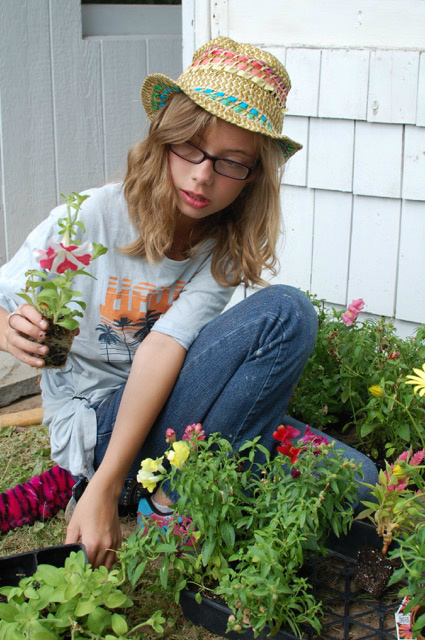 This is Karin Gonda Westerman from Phoenix, AZ. 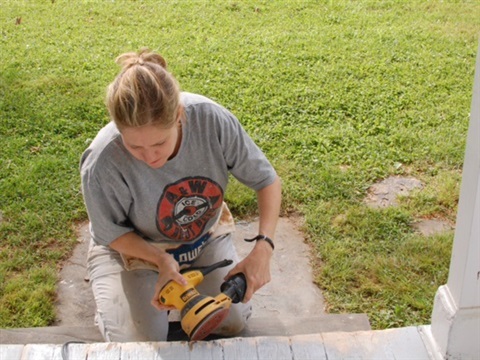 Karin and her parents visited the home in October of 2012 and helped in sundry ways ... Karin is painting the banister. This Karin's father Jeff. Jeff and Marsha are from Sheridan, WY. He is shown here holding the ladder for Raphael, but more important, when the ladder was extended to 20' he loaded needed tools in a bucket and relayed them up the ladder via a pulley system, as well as securing the ladder thus shortening an all day job to four hours. 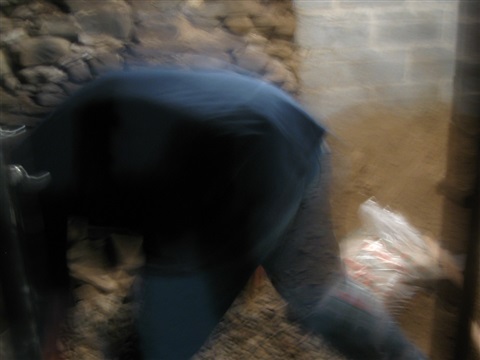 This is an unflattering view of Frank Hunsaker, of Portland, OR, who visited the home in Sept of 2010. 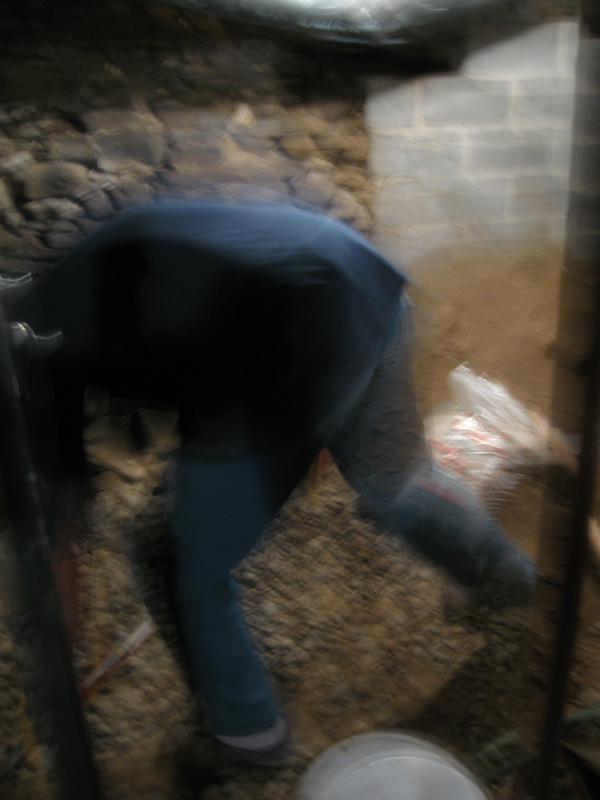 He is hauling gravel for the mixing of concrete in the basement stabilization project. 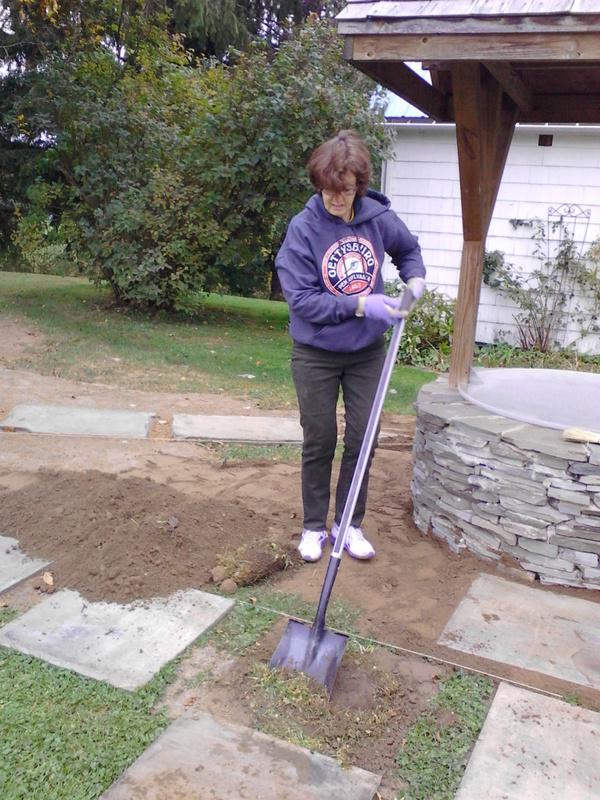 This is a view of the newly poured concrete footings on which the block wall, mentioned elsewhere, will sit on. 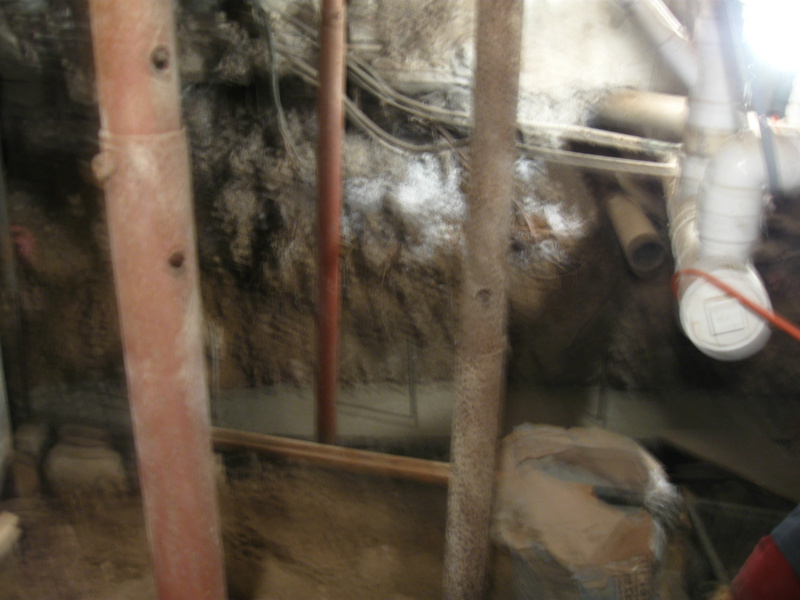 Another view of the concrete footings poured in the fall of 2010. 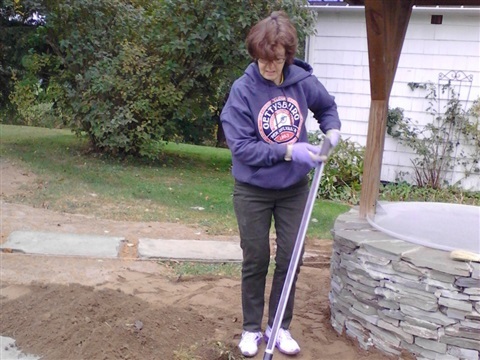 In the spring of 2011, we found the dirt underneath the stone stem-wall had caved in covering the footing to a depth of three feet. 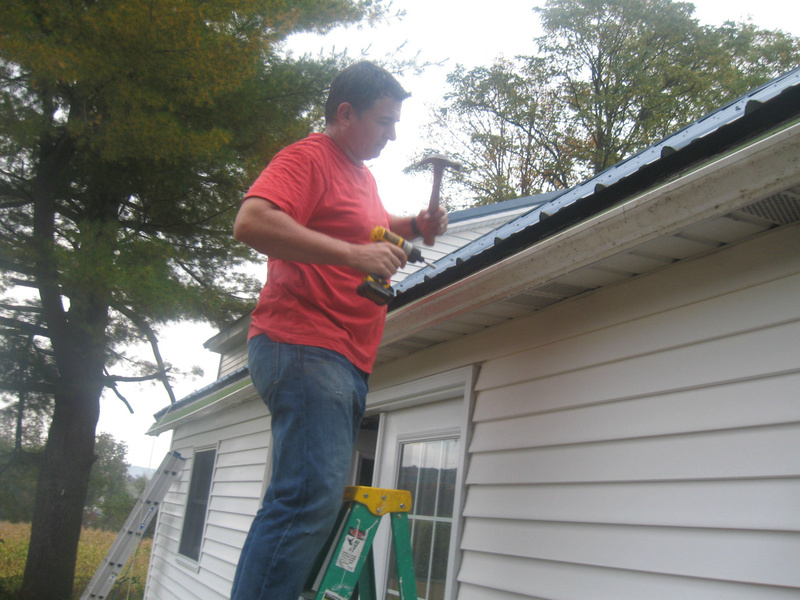 Meet Brother Matthew Baker, Upstate NY, CES Director of Institutes and Seminaries. He is shown here in resplendent and typical enthusiastic expressiveness standing in the home's modern kitchen. Brother Baker has shown the home(s) to many, many students and Senior Missionaries over the years. 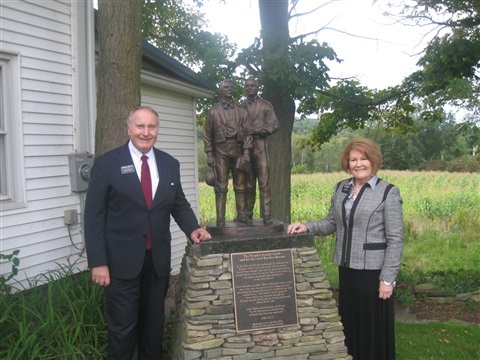 This photo, June of 2014, is of President and Sister Wirthlin of the New York Utica Mission. The Knight home lies within a quarter mile of the Mission's Southern boundary. 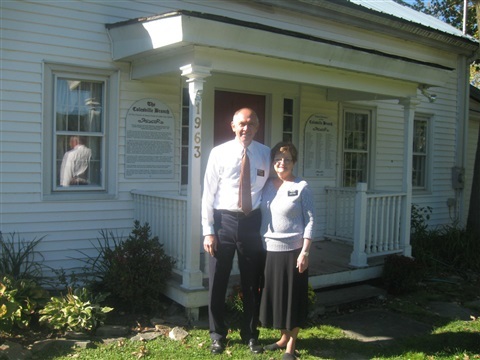 This photo is of Elder and Sister Jones, of Provo, Utah, visiting the home in October of 2013. Elder Jones is a descendent of Joseph Knight Sr. 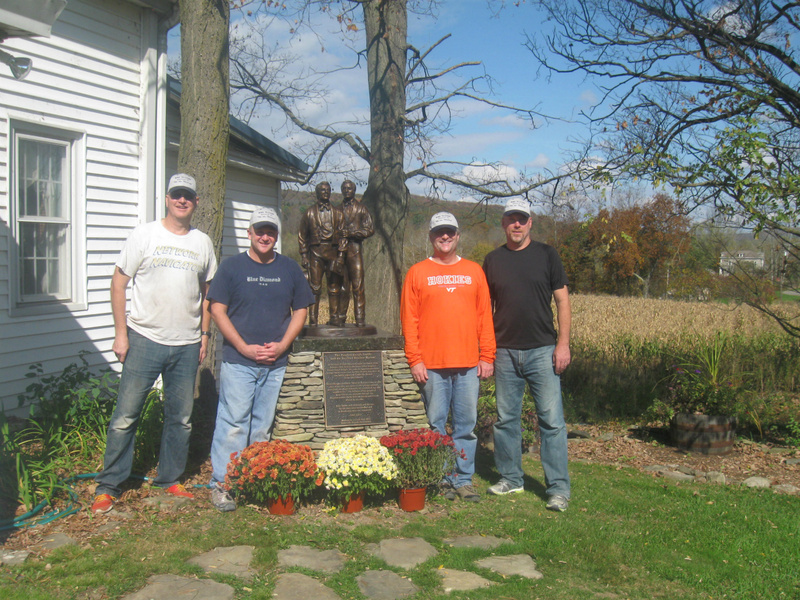 These photos are of Chuck Harris (left), Steven Luke (center) and Gene Stark (right). The fourth member of the crew, Scott Sizemore, is in the Blue "T" shirt in the photograph to the right. 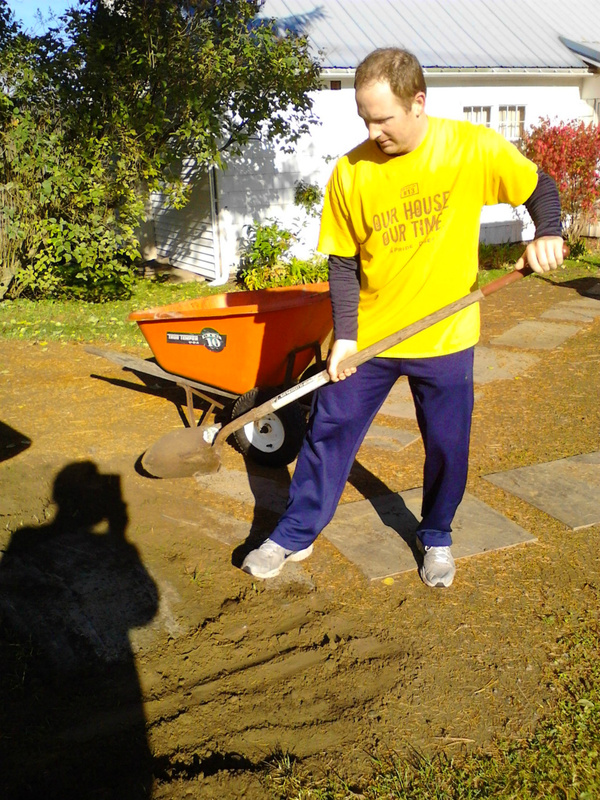 All were, at the time this picture was taken, (October 2013) from Stafford, VA. The Luke's (Steven and Amy and their daughter Alli) and the Harris' (Chuck and Lisa and their son Mason) made a subsequent on-site visit in June of 2014. 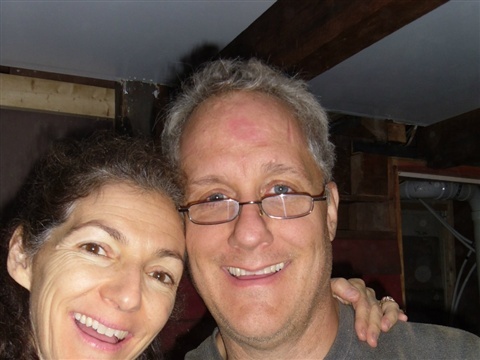 Steven and his wife first visited the Knight home in June of 2013. 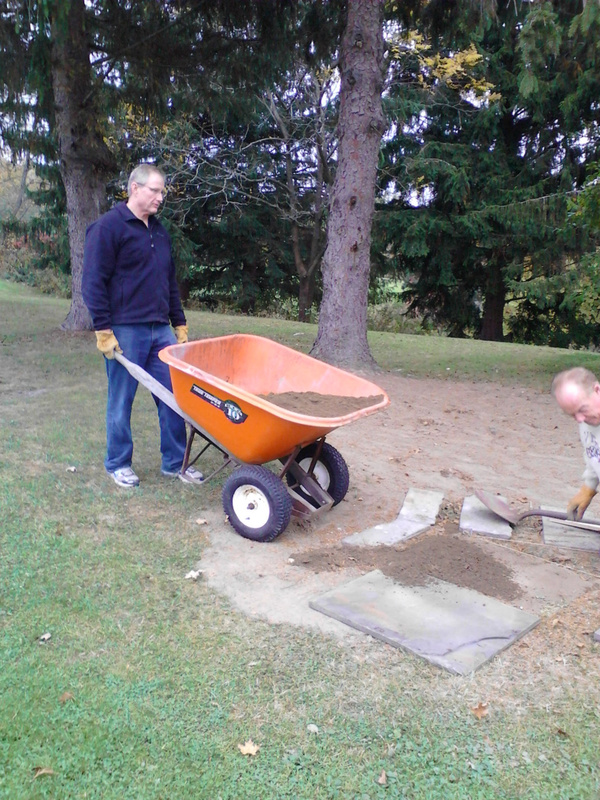 In August Steven called and asked if it would be alright if he brought a friend to do some hands on, on-site in October. The response was an enthusiastic "yes", please! What was initially a friend turned out to be three friends, all skilled and hard workers. 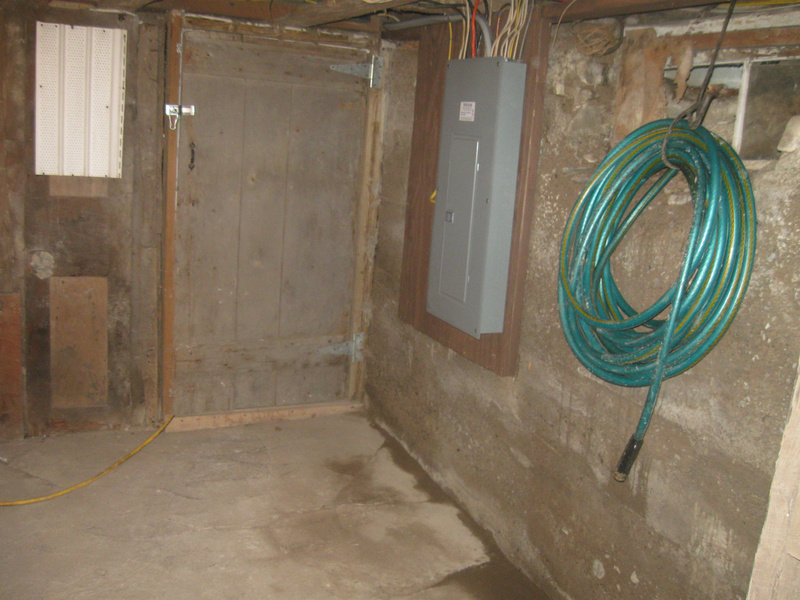 Their combined efforts, in essence, finished the carpentry work of the home's original upstairs bedrooms and landing. 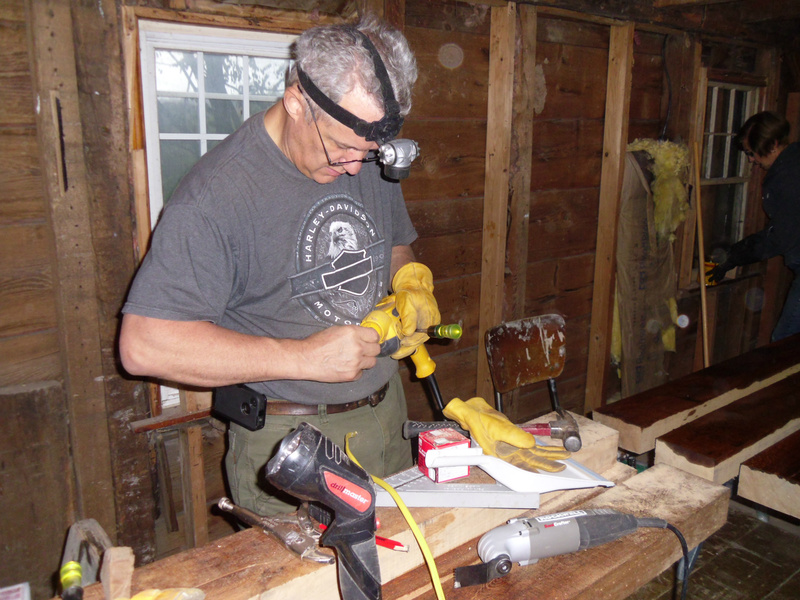 This was during a period of time when renovators chief carpenter was recovering from an accident and was unable to perform heavy labor. 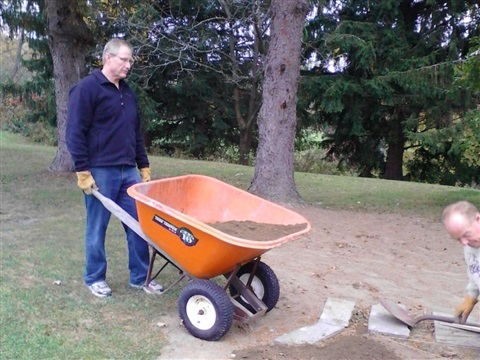 Their willingness to contribute and their timeliness in doing so was another "tender mercy"
This is is Richard E. Morrey of South Jordan Utah. We met Richard, his wife and sister in-law in June of 2012 at the Knight home. They were on a much anticipated self guided tour of Church historic sites. They were shown through the Knight and Stowell homes then departed. Curiously, they showed up at the Knight home the next morning. 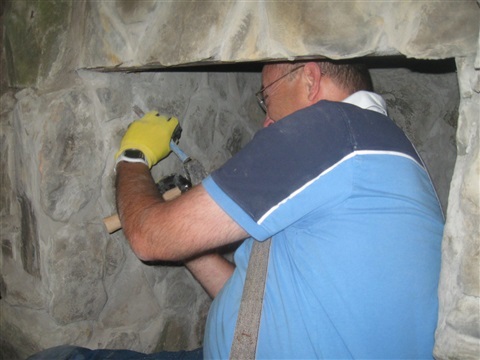 Richard indicated that he had been up most of the night wrestling with a prompting that he needed to stay and work on the house versus continuing the Church history tour. 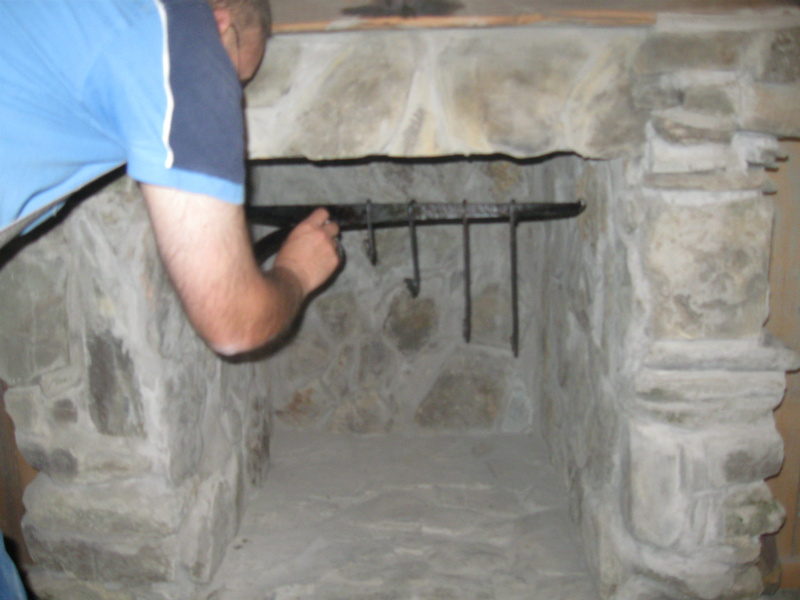 During the course of conversation it was revealed that Richard's hobby and passion was Blacksmithing. 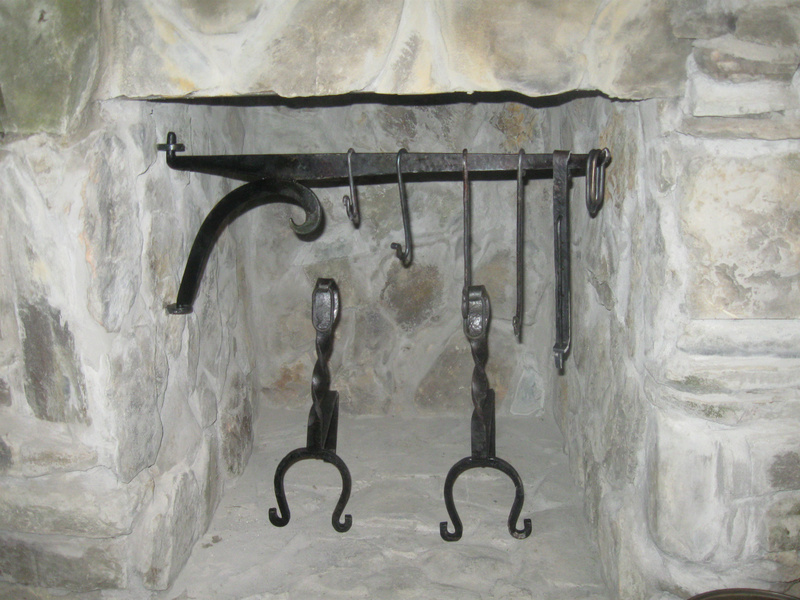 It was decided that they would continue their tour, then once home Richard would make a swing-arm assembly for the newly laid kitchen fireplace. In making the swing arm; incidentally it was patterned after the one in the Whitmer cabin in Fayette, he decided to hand forge the metal parts rather then weld them together. Richard returned with his nephew in Sept. of 2012 with the swing-arm and andirons. 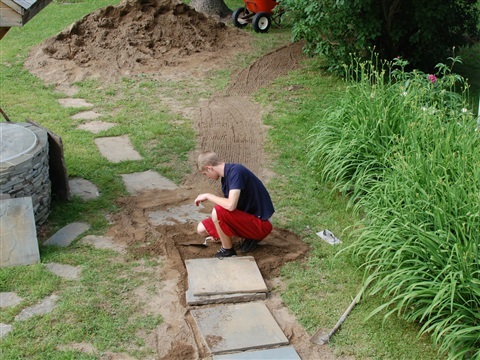 These photos are of Richard installing and inspecting his creation. 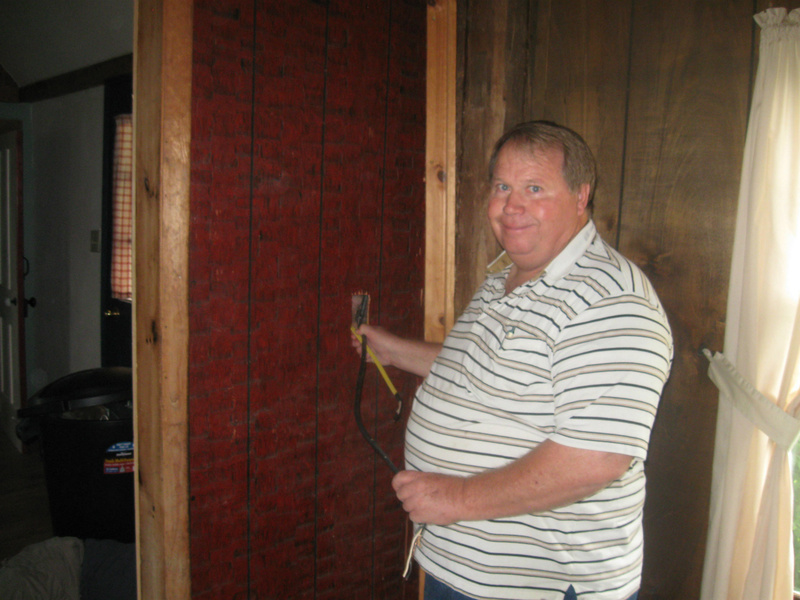 This is Stan Ferrin, master electrician and owner of Ferrin Electric in Mesa, AZ. Stan was introduced to us by members of the Knight family, Grant and Cindy Palmer. After hearing of the ongoing restoration project in Colesville, Stan indicated that he felt impressed to contribute his skill and talents to the project and asked if there was anything in particular he could do. His willingness to contribute was a literal answer to a prayer. 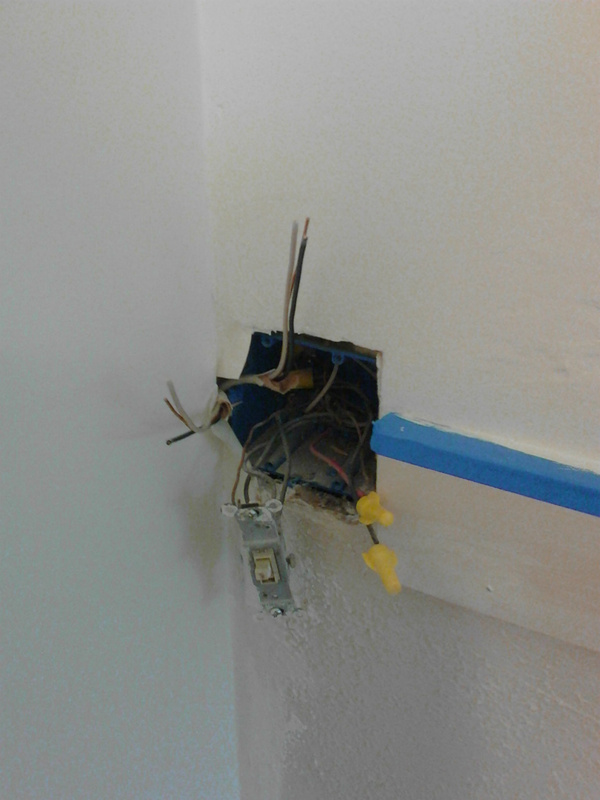 Since day one, the outdated, hazardous, inadequate wiring and electrical amperage in the home had vexed us. 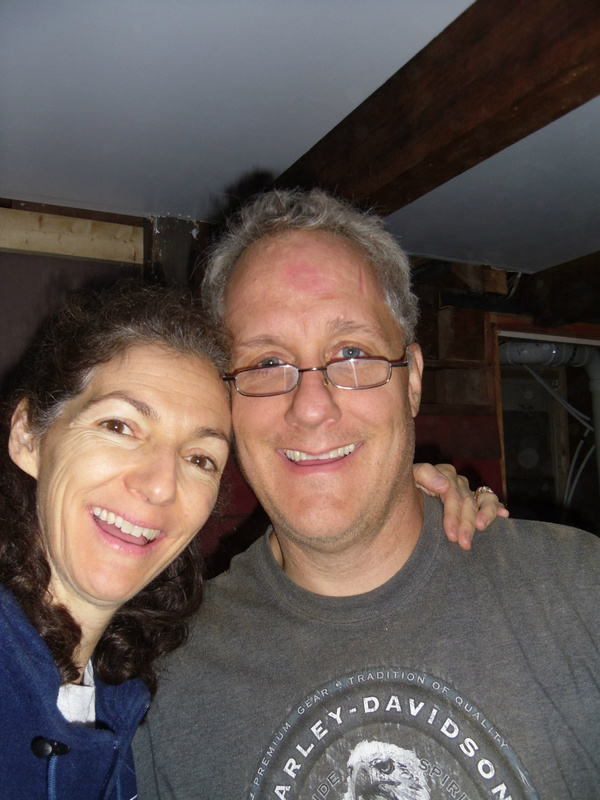 Stan and one of his employees, Todd Belbance, showed up in NY in June of 2013 with the expectation of spending a week doing all they could to bring the house up to code. 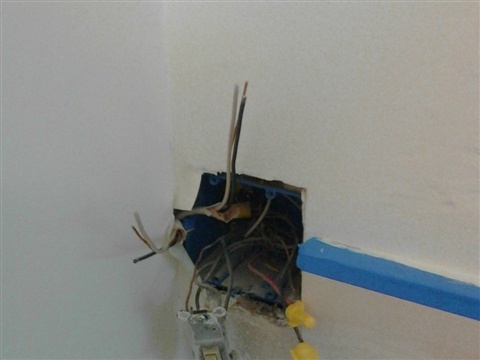 After reviewing the condition of the electrical system, they later confessed, that one week was being generously optimistic. They contributed their invaluable time, we supplied the material. These three photos feature Joe and Claudia Hilton of Tempe, AZ. 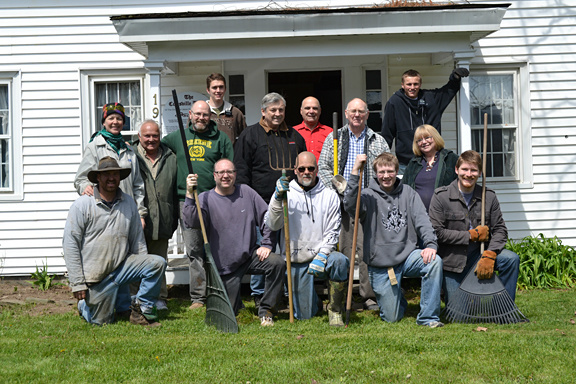 In the fall of 2012 they felt a strong impression that they were to visit and work on the restoration of Knight home. Their visit proved to be a "tender mercy"! For several years we had contemplated how the beams in the "Lean-to" room could be installed. They were hardwood Oak and weighed approx. 100 lbs each. There were 12 of them. Joe stated, upon arrival, "I know how to do it, I helped do the very same thing in the Wilfred Woodruff home restoration in Little Cottonwood Canyon." 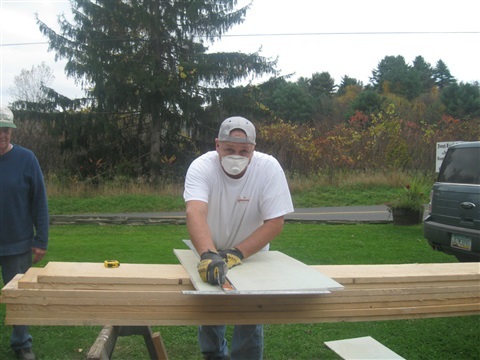 Joe helped install the beams by fitting the newly cut beam tenens into the existing mortice joints of the summer-beam, then hefting and working the beam into the opposing posts mortice joints. 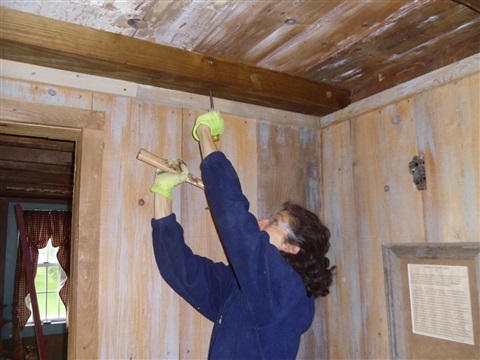 Meanwhile Claudia helped age and antique the "new" beams prior to their installation. 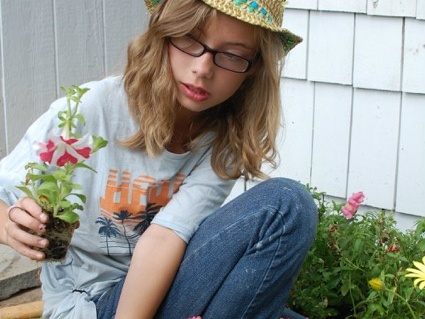 Meet Ali Luke, daughter of Steven and Amy Luke from Stafford, VA. Amy, at her suggestion and initiative, is planting a new flower garden on the grounds of Knight home. This is a photograph of Mason Harris, along with his parents Chuck and Lisa Harris from VA, visited the site in June of 2014. 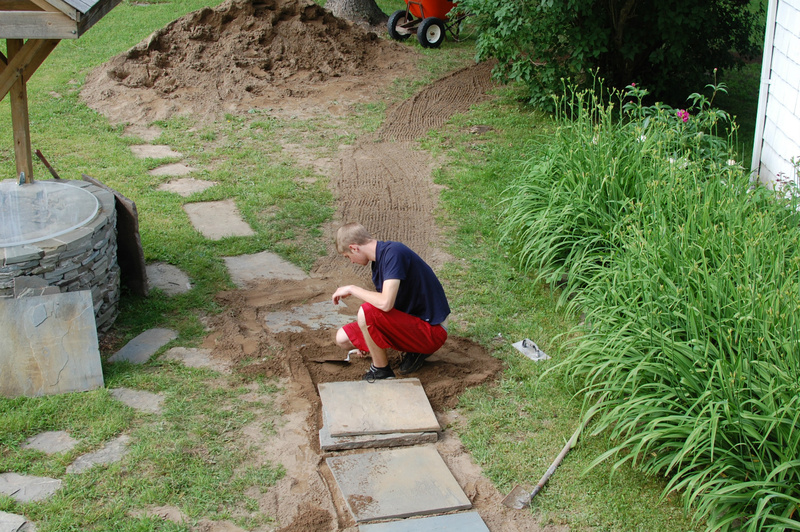 Mason is laying one of the many stones for the new walkway. Amy Luke visited the site in June of 2014 with husband Steven and daughter Ali. 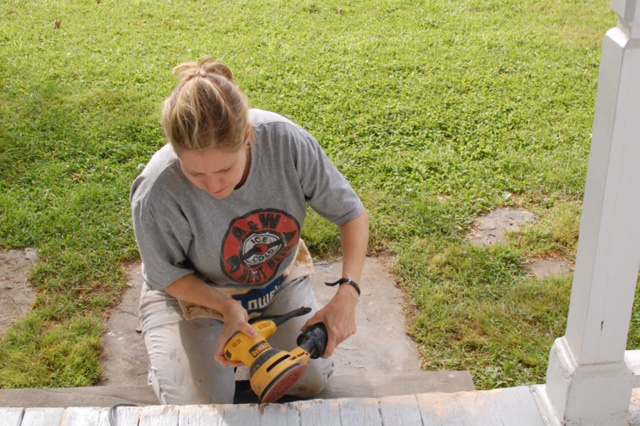 She is preparing the front porch for its annual coat of paint, a testament to the neverending maintenance that is required. 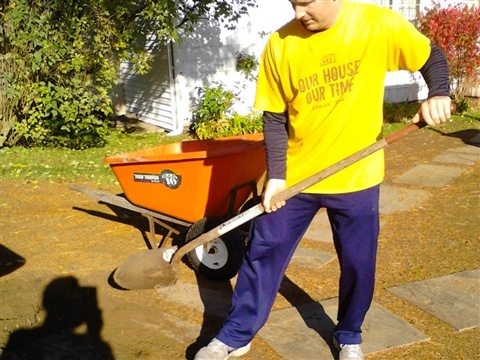 This photograph is of Kyle Bate, from Phoenix , AZ, working on the newly laid walkway of the Knight home in October of 2014.
that his wife, Cheri, can spread the soil and level the base for the paving stones. 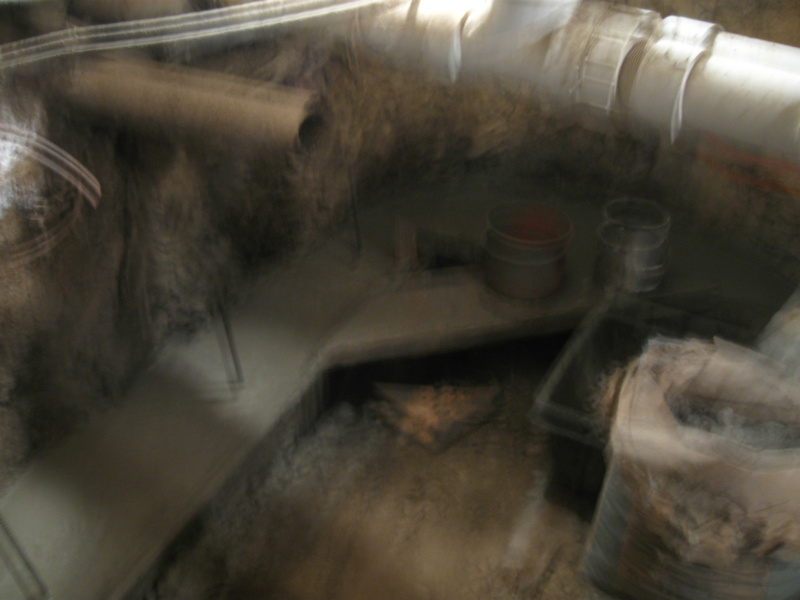 They were onsite in October of 2014. Meet Grant and his brother Monty Palmer of Mesa, AZ. 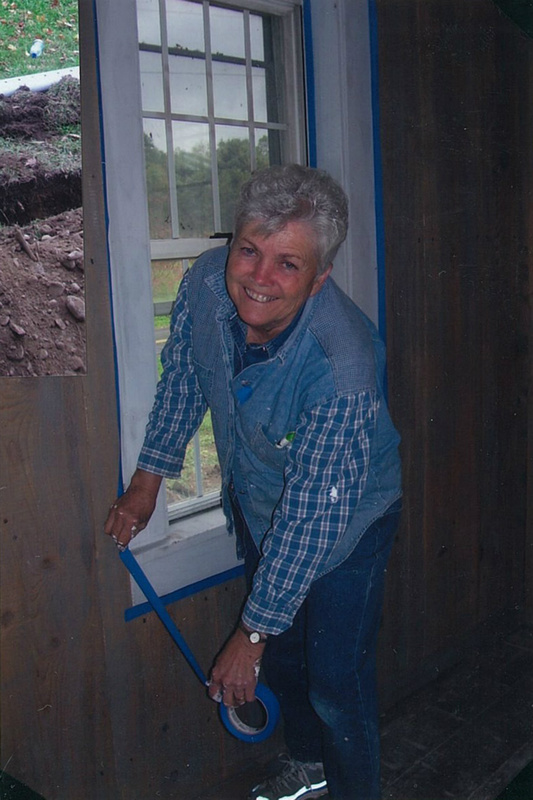 Grant's wife Cindy is shown in the succeeding picture. Both the Palmer brothers and Grant's wife Cindy trace their respective linage back to Joseph Knight Sr. 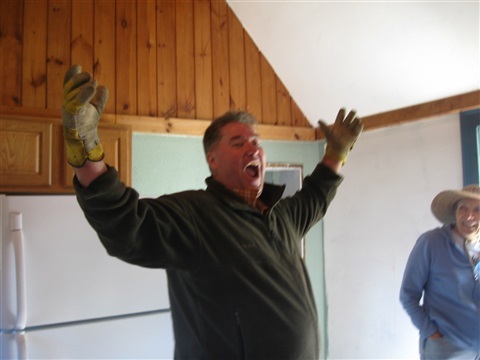 In 2008 the Palmer's met with owners of the property and suggested that they would like journey back to New York to see the home, but more important they would like to roll up their sleeves and do some work ----- hard work. 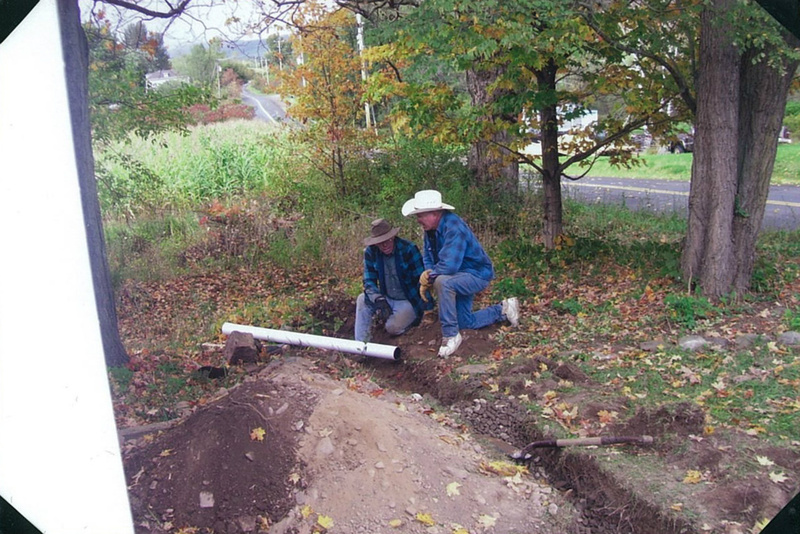 Grant and Monty installed a French drain across the front of the home in an effort, which worked, to keep water from seeping into the basement. Cindy is taping a window in preparation for painting. 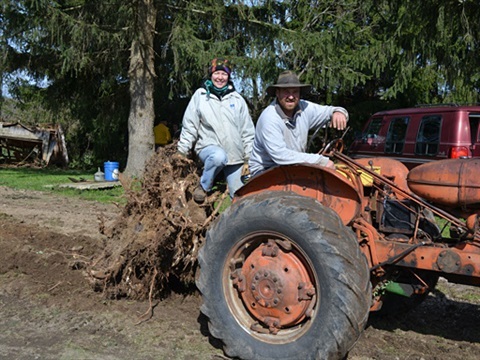 Grant and Cindy returned in June of 2013 to provide further help. They turned the many boards (2X6's) on the rear deck then stained and finished them. Their kindness and friendship over the years has been gratefully appreciated!